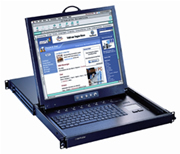 MODEL# A19P8, LCD console with 8-port KVM switch. 1U Rackmount, 19" LCD Monitor (TFT/ LCD active matrix color, Resolutions - 1280 x 1024) LCD, 8-PORT KVM Switch, combo (USB & PS2) Keyboard and Mouse (Touch-Pad). KVM cables and rail set included.